Place the chicken tenders and hot water into the electric pressure cooker insert and sprinkle the sliced white mushrooms and red bell pepper slices over the chicken. Pour the marinara over the top, then sprinkle the Italian seasoning and a pinch of salt and pepper over the top. Cook on: Manual/High for 18 minutes. Once cooked, strain off any excess liquid and then shred the chicken into the marinara. Add the shredded mozzarella cheese over the top and let melt. Then add dollops of ricotta cheese, and some grated Parmesan cheese on top. 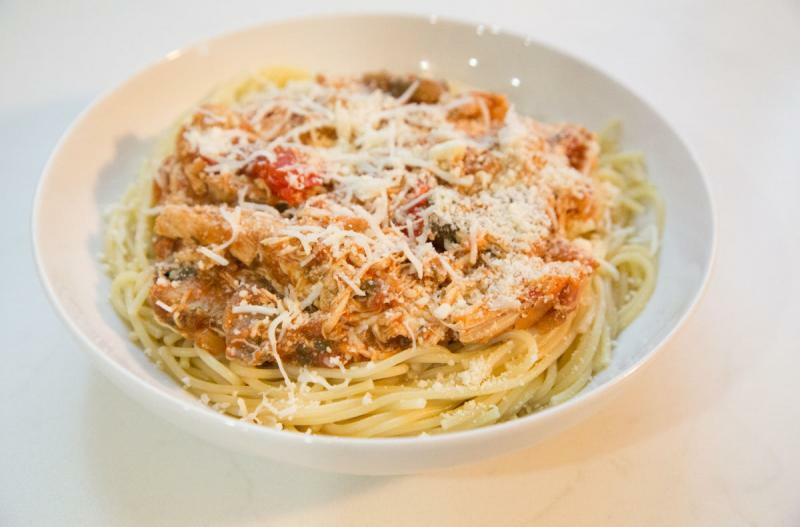 Serve Instant Pot Shredded Chicken Parmesan over pasta with side salad. Thaw, add hot water to Instant Pot and then add contents of baggie. Cook on high pressure for 18 minutes with sealed valve; then natural release. Strain and shred the chicken into the sauce. Top with shredded mozzarella, ricotta and grated Parmesan cheese after cooked.